It all began in 1870 when a young Joseph Westerby started out in life as an apprentice corkscrew maker with the Brookes and Crookes corkscrew factory in Sheffield. 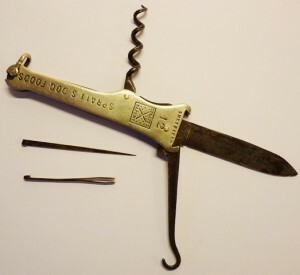 Westerby worked on some of the first specialist grooved worms and the development of engraving techniques for branding corkscrews, either with the name of recipients or with an advertising slogan, logo or brand message. Just a few years earlier, there was a young lightening rod salesman by the name of Jack Spratt working in; yes you’ve guessed it, sunny thunderstorm-free Cincinnati. Now Mr Spratt’s order book was looking decidedly lean, rather too lean for his liking. So he upped sticks and set off across the Atlantic to try his fortune in London. Not with lightening conductors, or even you might have thought printed corkscrews, but of all things dog biscuits. In 1860 he had founded Spratt’s factory in Holborn and became the first industrial manufacturer of dog biscuits, or ‘meat fibrine dog cakes’ as one of his key employees responsible for developing the brand first called them. As the company became increasingly successful others tried to produce copycat dog cakes. So Jack Spratt decided he needed that extra something to protect his brand. One day he was browsing through the company’s books when a came across a whole series of large “X”’s in the ledgers. His key employee used these to distinguish between trade and private clients, but for Spratt this was a Eureka moment. “That’s it!” he’s though to have cried. “The eXtra factor”. Something that will no doubt have Mr. Cowell reaching for his personaI bottle opener, but I’m afraid Mr. Spratt was way ahead of you. For ever since the brand “X” logo has appeared on Spratt’s products. Ok that’s the patented dog biscuits out of the way, but what about printed corkscrews I hear you cry? Well, Spratt’s wanted to advertise their brand to high wealth dog owners. So what better segment of the market to target than the upper class hunting shooting fraternity, whose predilection for sumptuous picnic shooting parties were all the rage. Not always having Charles the butler on hand to open the claret, mean that a handy corkscrew with a few other useful tools attached, was, so to speak just the biscuit. So Spratt’s key employee, the one who had done all the brand X development work, got in touch with Joseph Westerby and had him produce one of the first promotional corkscrews, more properly a Waiter’s Friend type pocket bottle opener with “SPRATT’s DOG FOODS” and the soon-to-be- famous brand X stamped and engraved on the handle. This early advertising corkscrew was a great success and much in demand amongst the landed gentry. As well as a worm for extracting corks and a very useful knife blade for taking the foil off wine bottles, and no doubt removing stones from horses’ hooves, it also featured an ingenious graduated device for extracting spent gun cartridges. Features which the present day Waiter’s Friend Company, who specialise in the supply of all types of advertising and promotional corkscrews and printed bottle openers, are always pleased to discuss with customers looking to use a branded corkscrew to promote their brand name. So, there you have it; the curious tale of the advertising corkscrew and the dog biscuit. Who was Spratt’s key employee, the one who did all the work on their advertising corkscrew? None other than Charles Cruft, founder of Cruft’s Dog Show.